Our new menu is available now. The cocktails within it have been developed by our whole team, led by General Manager and Head Bartender, Charlotte Wood. 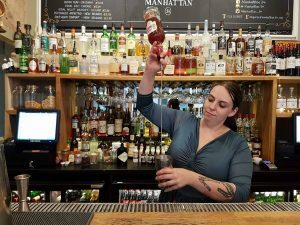 So we thought this might be an opportune moment to find out a little bit more about Charlotte and her bar-tending world. How has the new menu been developed? We’ve done a lot of work to make sure the menu is contemporary, to fit in with current trends, but also to make the drinks a bit more fun and more interesting then they were previously. We’ve tried to throw a few surprises in there and most importantly make a menu full of fantastic drinks that you can’t get anywhere else. How do you go about developing a new cocktail? There are many things that inspire me. Sometimes I’ll start with a product I want to use, or I might see a piece of glassware that makes me just say “wow, I have to use that for a drink.” Other times I might find a really cool flavour pairing that I then develop into a full drink. And sometimes things are just pretty and therefore I know they should be made to a high enough quality to earn a place on our menu. Sometimes you use a theme? Yes, with the recent Game of Thrones featured drinks menu the team and I were literally counting down the days until the new series started. So making custom drinks to celebrate this season was an obvious way to go. It was really fun to dream up the drinks and the team really got behind it, throwing in some fantastic ideas. We were all scouring charity shops to find unique glassware, and they were suggesting incredible flavour combinations and linked spirits. We’ve had such a great response from our customers too, so we’ll be looking to do more of this kind of thing in the future. How have you learned these skills? With cocktail making it is a labour of love. You are always learning. You create something and see if it works, and if it doesn’t you learn from your mistakes and become better because of it. You have to start with a good grounding in the classics. 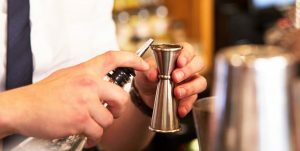 I’ve been lucky enough to work in some of the great cocktail bars in Leicester where I learned a range of skills and perfected the basics – some bars you just need to develop speed of service, whereas working behind the bar for a fine dining restaurant you need a completely different approach to create something that’s at the top of your game and keeps Chef happy, and that’s how I learned to create unique drinks and developed my own style. You’ve put so much time into its development, so how is the menu personal to you? I couldn’t pick a favourite drink that I’ve created for this menu, but there plenty I’m proud of. If I didn’t like a cocktail, it wouldn’t make it to the final menu – the customers would never see it. The cocktails I enjoy drinking myself tend to be on the classic side and so you’ll see a lot of that inspiration on the new menu. I love the Negroni – really boozy, really simple – and so I make a lot of cocktails in this sort of style. I also adore champagne cocktails, you can really add a different dimension to a drink by injecting bubbles! So with drinks like the Transatlantic you get bubbles and glitter, which lifts this Southern Comfort based drink to an entirely new level. The one thing I’ve never been a fan of are drinks that are heavy on fruit juices. I always feel that you can hide a multitude of sins under juice – its a way of covering up that you don’t really know what you’re doing… It turns out that this is quite a good thing to shy away from because the amount of people who have special dietary requirements and need to keep their sugar intake low seems to be increasing. I enjoy creating serious, grown up cocktails that don’t have the added sugar that fruit juice gives because my dad’s diabetic so it’s something that is quite close to my heart. It’s nice to be able to create something he can enjoy. So which drinks tend to have a lower sugar content? The Connoisseurs range – of course they still contain some sugar in but the flavours are not overly sweet – the spirits are I use are all barrel aged so the flavour comes from the wood rather than having to have a lot of mixers added. Also if you go for the low ABV menu they’re naturally lower in sugar because they tend to be a more spritz style of drink that is a bit lighter. Anything particularly unusual in the new menu that we should look out for? I made a twist on the classic Bloody Mary – the Barbecue Bloody Mary. Instead of the traditional vodka, I’ve used Buffalo Trace bourbon, so it’s got that American culture feel. The barbecue element comes from using sriracha instead of tabasco and the Worcestershire sauce has been swapped out for liquid hickory smoke. The final drink is garnished with beef jerky I make myself- so while it is an unusual drink, the Bloody Mary concept is familiar enough that people are willing to give the new menu a whirl.